Plenty o’ rain has us indoors for now, on this side of Lake Erie, and — since it’s the last day of May — I’ve got a few more thoughts about ch. 5 in Stealing All Transmissions. Come August 1979, The US version of The Clash is finally out, and the band is mixing and wrapping up their work on London Calling. That September, they arrive in the states for the Take the Fifth tour and, come 19 September, arrive in New York City. 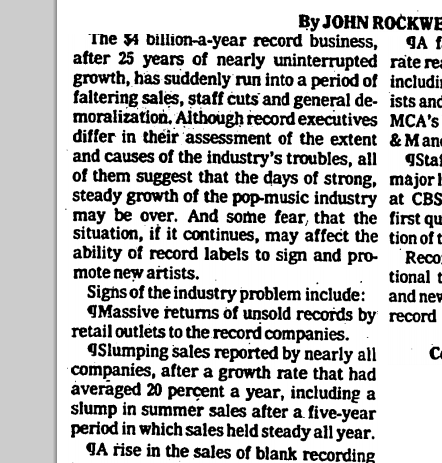 From J. Rockwell, “Record Industry’s Sales Slowing After 25 Years of Steady Growth,” New York Times, August 8, 1979.
for the New York Times. (I’ve also written about importance of Rockwell here.) It’s also a tough year in pop, business-wise. The Clash’s UK label, CBS, had a tough first quarter, and pink-slipped 52 employees shortly thereafter. Net income dropped, and CBS blamed its record division. Is home-taping the culprit? Does this theme sound familiar? The industry of course rebounded, and did well for ages, but it’s difficult to imagine 2015 (or any year after) holding good news, profit-wise, for the music industry. No big surprise to see Talking Heads and The B-52’s in the mix, but especially nice to see The Clash, Ian Dury, and even Steve Reich mentioned–and perhaps because of the dip in humor of Give ‘Em Enough Rope, imagining The Clash as less fun than Joe Jackson or The Police. I figure Rockwell changed his tune, though, once he heard London Calling. Click on the image to pull up the full article.